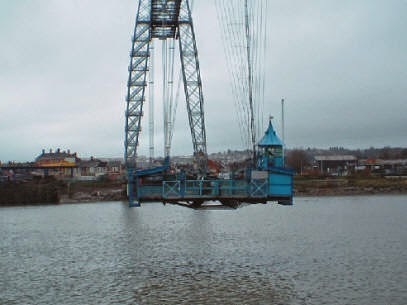 A general view of the Newport Transporter Bridge. The span is 75 metres above the river and is 210 metres wide. Completed in 1906, this unique grade 1 listed structure was designed by the French engineer Ferdinand Arnodin. The bridge is effectively an aerial ferry to enable the River Usk to be crossed and in so doing enable the development of the Orb Steelworks on the east bank of the river. The bridge comprises a suspended railway track running between two sets of lattice towers. running along the track is a traveller from which is suspended a platform or gondola which allows pedestrians and road vehicles to be transported across the river. 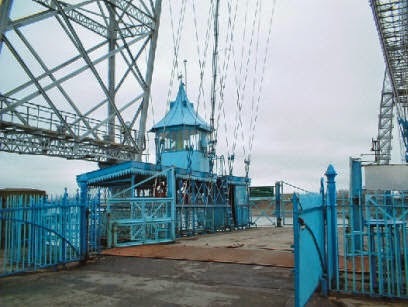 The bridge is electrically operated and the gondola is pulled across the river by means of a cable which is wound around a drum located in the motor house situated on the east bank of the river. In the past, up to eleven crew operated the bridge, but today a total staff of seven are employed, comprising two sets of drivers and conductors, two maintenance men and a superintendent. The bridge operates approximately every 15 minutes and can carry up to six cars or light commercial vehicles. When opened, the bridge operated from dawn to dusk but although tolls were charged the bridge was never able to pay its way and by 1919 was costing the Council £6000 per annum. Tolls were discontinued in 1946 and in 1964 a second river crossing, George Street Bridge, was opened just a short distance upstream. 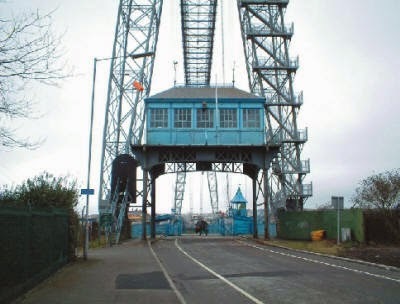 In 1979 the bridge celebrated its 75th anniversary and at this time was given Grade II listed building status which was subsequently upgraded to Grade I in 1996. For some years it had been noted that deterioration of the structure was occurring and by 1985 strand breakages in some of the cables meant that the bridge had to be closed on safety grounds. The owners at the time, Gwent County council, obtained funds from CADW and also the European Architectural Heritage Fund and in 1992 work commenced on a major renovation programme. The first phase was the refurbishment of the towers and access ways which was completed in 1993, while the second phase tackled the replacement of the main anchor and catenary cables during 194. The final phase involved steelwork repairs, surface protection to the main boom, gondola and motor house. Other areas were also renovated including the electrical and mechanical systems and floodlighting which replaced the festoon lighting was installed in the mid 1980s. The bridge was reopened in December 1995 by Clare Short, MP, the shadow Secretary of State for Transport. 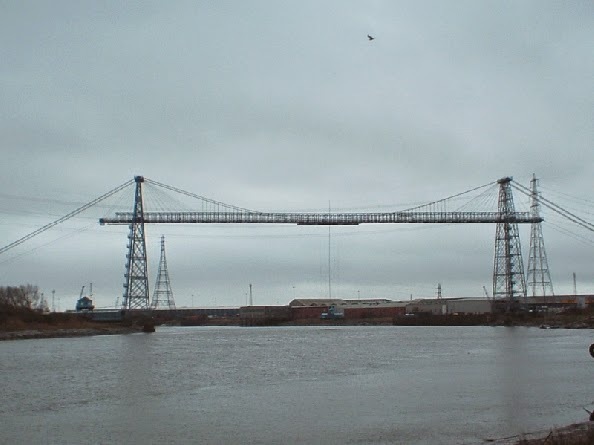 In April 1996, the ownership of the bridge was transferred to the new Newport County Borough Council and in order to offset the running costs of £160,000 a year a 50p toll for vehicles was introduced although pedestrians and cyclists travel free of charge. The Council is embarking on a programme of regeneration of the river front area and the bridge will form an important part of this. A view of the gondola, stopped at the west bank of the River Usk. can accommodate up to six cars. The motor house located on the east bank of the river. The gondola in action, approaching the east bank of the River Usk. The speed of travel is approximately ten feet per second. on the west bank of the River Usk. 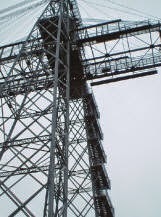 Newport Transporter Bridge in operation, 17th March 2005.